Have you heard of Pick Your Plum? It’s a wonderful “deal a day” site that offers craft and baking supplies, home decor, clothing and other terrific finds. I have ordered jewelry making items from them in the past and awhile back I came across a daily deal that I had a need for plus I thought it would make a nice gift. I ordered a few sets of the daily deal and here it what I made with it! This is the item I ordered. A smooth, rounded corner, small block and a magnet board. The creative possibilities for these two pieces are endless. 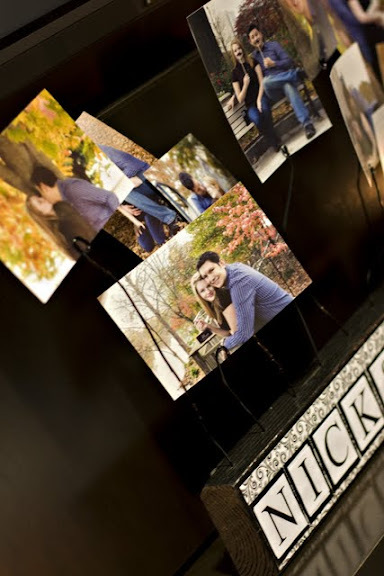 A sweet spot to hold photos, or with chalk paint it can be used for a message board. 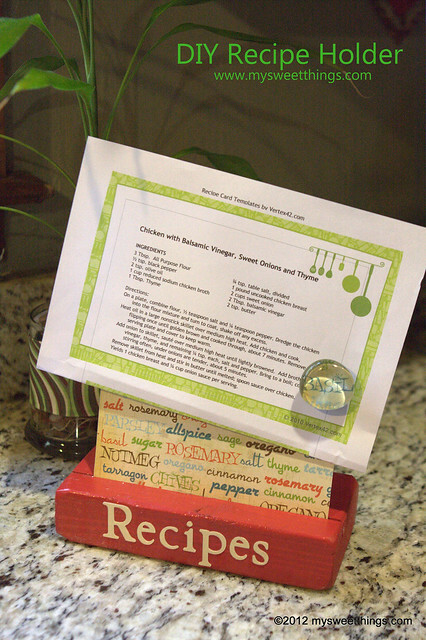 My thought was recipe holder. 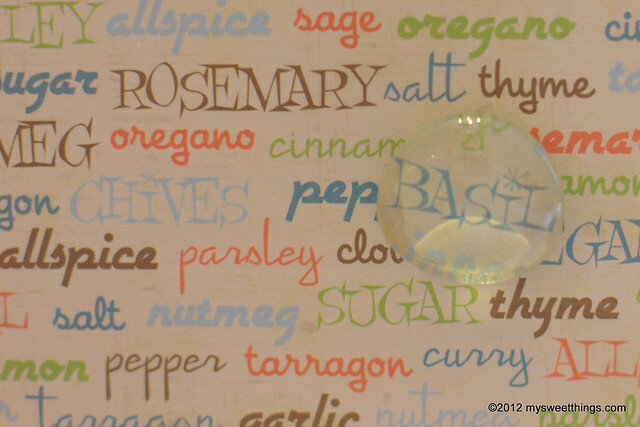 I used my BFF of crafting Mod Podge and a sponge applicator and applied it to the front side of the magnet board. I then applied some craft paper to “pretty” it up! All those items can be purchased at most craft stores. I usually pick my items up at JoAnns. After I applied the craft paper to the board, I then layered it with a thin coat of Mod Podge on top of the entire piece of paper. I had some leftover flat marble pieces from my Decorative Magnets I made awhile ago. Using a pencil, I traced around the flat marble on a piece of craft paper. I used a small craft brush to apply the Mod Podge on the back side of a flat marble piece. The pretty side of the paper will lay flat on the Mod Podge. 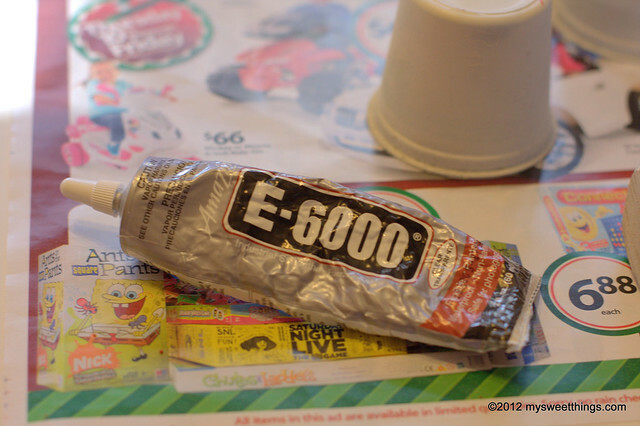 E-6000 is a great industrial strength adhesive that can withstand stress and vibration. 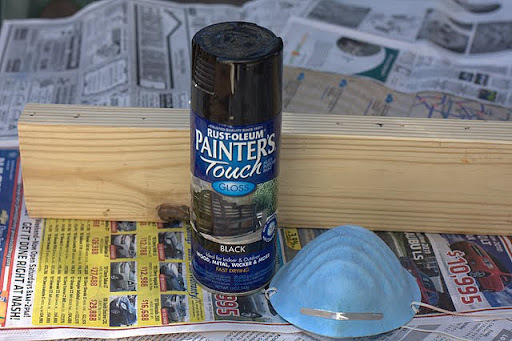 It can be used on solid and non porous surfaces and mends just about anything! I love this stuff. 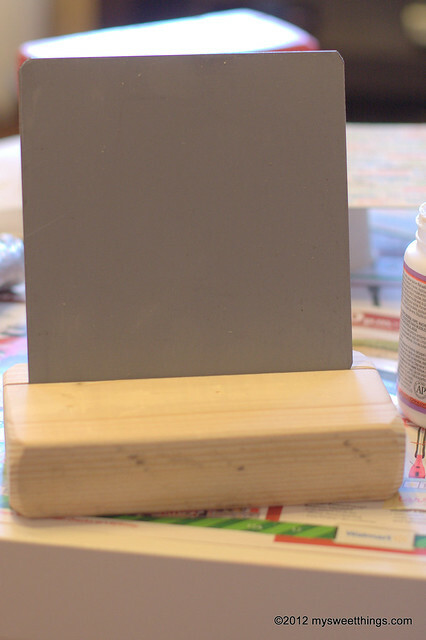 I used it on this project to hot glue a super strength magnet to the back of the flat marble. This pretty, helpful item, sits on my counter and I use it often! For the letters I used scrapbook paper that I cut with my Cricut personal cutting machine using the Classic Font Cartridge. For more ideas on what you can use Mod Podge for, take a look at my Thank you sign and my Celebration Board! You can also visit Amy at Mod Podge rocks. She has loads of fun stuff! I’ll be linking to some great parties this week. Hop on over to Amanda’s Weekend Bloggy Reading at Serenity Now for some crafty inspiration! P.S. Mod Podge peeps do not know who I am. 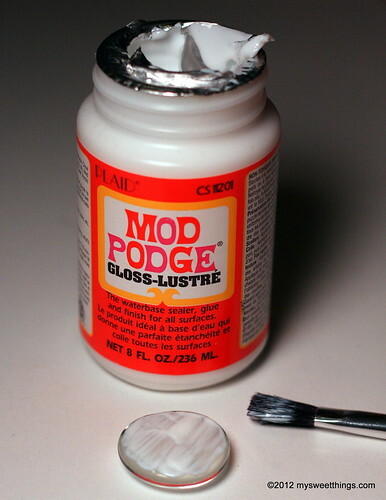 I love the stuff and buy gobs of it for craft projects, so I thought I’d share it with you! What to do with a leftover piece of 2×4? Make a Celebration Board! A few summers ago we had our back deck replaced and that left us with plenty of 2×4’s hanging out in the basement. 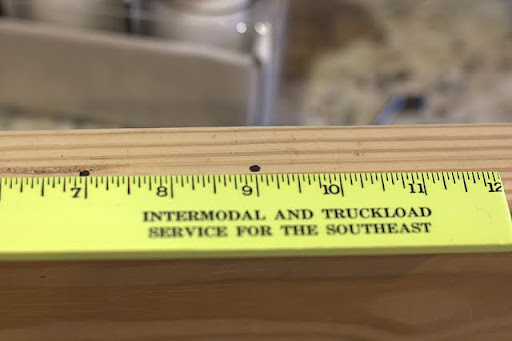 For those that are unfamiliar with the term, a 2×4 is a common size of dimensional lumber. My dad is a builder of all things and I am very familiar with these boards as I would hold them while he sawed away. I had never thought outside the building box until I came across a blog post from How Does She? 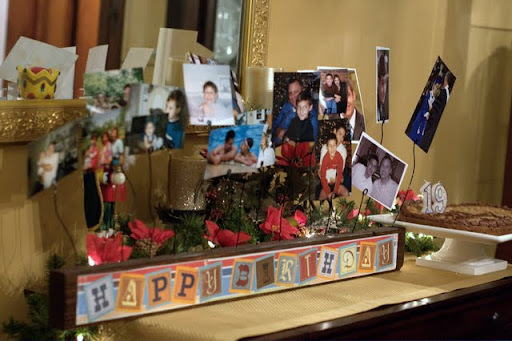 A 2×4 was used to create a wonderful birthday board! It was love at first site! I made my first board last summer for my husband’s birthday and then used it again for my son’s birthday in December. I chose papers that are gender neutral so I can use it for all birthday’s. The Birthday Board set up for my son’s birthday party. The pictures on the far left are from when he was a baby moving along the board up to High School Graduation. 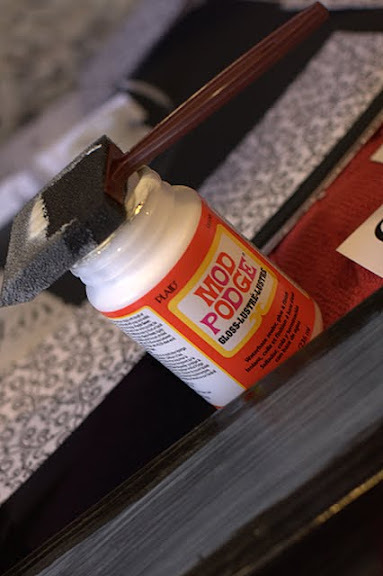 Mod Podge, craft paper, floral wire, a foam brush and the star of the show…The 2×4! After I cut the 2×4 to the length I wanted, I measured out the spaces to drill the holes for the floral wire. My board was 24 inches in length. I marked my spaces two inches apart. I wanted enough space between the 4×6 photos I had printed. 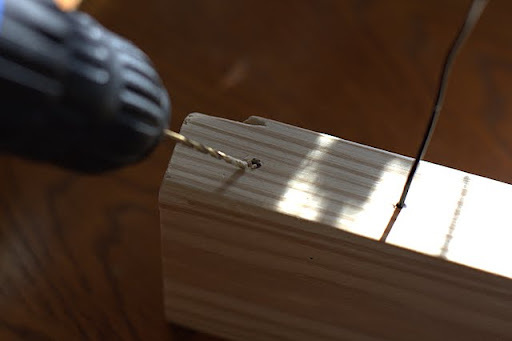 Keep in mind that the drill holes should be the same size as the floral wire tip that will hold the photos in place. Here you can see the floral wire and the drill bit I used. After all the holes were drilled, I lightly sanded the board to smooth out the drill holes. I then painted the board. For the Birthday Board I used two coats of wood stain. 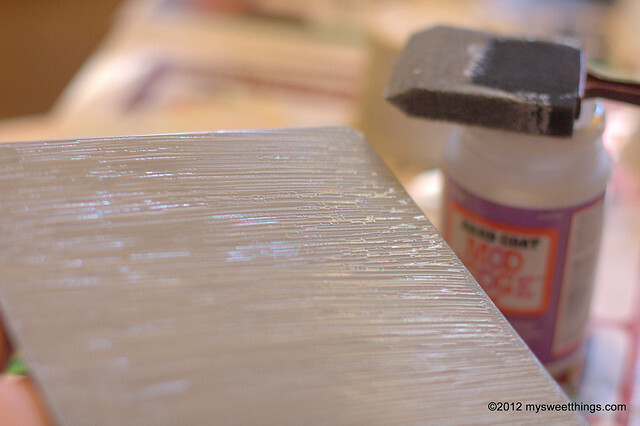 The photo above is for another board I recently made and I used left over Gloss paint I had in my stash. After the board was dry, I measured out the length of craft paper I was using to decorate the board with. I used a 12×12 piece of craft paper and I cut strips to fit the 2×4. I applied Mod Podge to the board then I placed the craft paper on top of it. Here you can see how the background paper is now on the board. I cut out the letters, applied Mod Podge to the back of them then place the letters on top of the background paper. 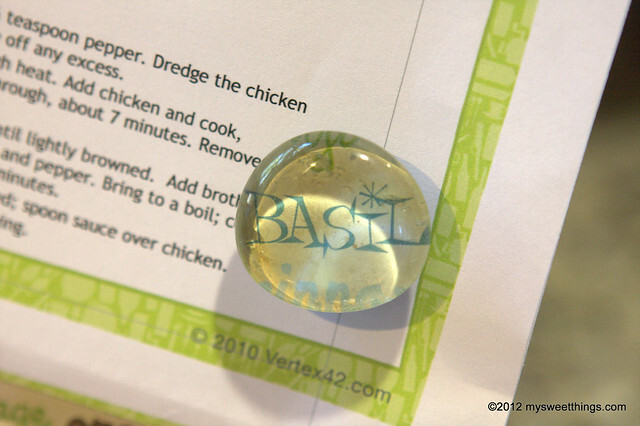 If you see any bubbles appear on top of the paper you will want to smooth those out. When the letters are all placed on the board, apply another coat of Mod Podge across all the letters, covering the entire top of the board. Here is a close up of the board I recently made. I used 20 gauge floral wire and I cut it into different lengths so the photos could be placed at different height. 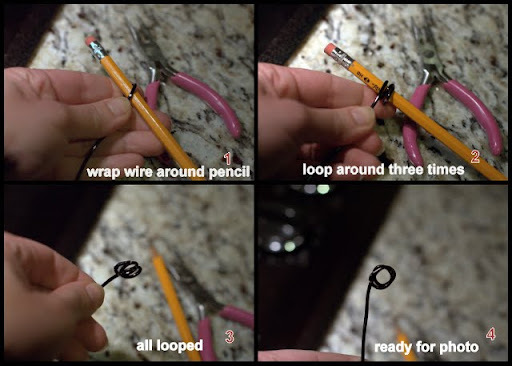 I wrapped the top piece of floral wire around a pencil to make several loops. The loops are what hold the photo in place. 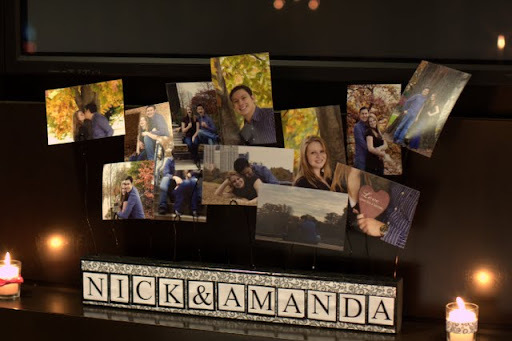 N & A Engagement Board! I love how the 2×4 can be used for any event or non-event. This board can be set out and photos changed throughout the year. Thanks to How Does She for the inspiration! I hope the celebration boards I made inspire you too! P.S. I am linking up to WhipperBerry. A whole lot of craft inspiration there! Guess what? This post was featured from the Friday Flair!